Investors are starting to get concerned with the sharp decline in Redbook same store sales growth. It fell from 5.2% to 4.2% in the week of March 2nd. That’s the slowest pace in 10 months. Month to date sales were down 1.6%; that’s the 8th consecutive negative reading. The full month year over year gain was 4.8%. Weekly year over year growth is now less than half the 9.3% growth peak in December. Even though the Redbook sales report gives us an early look at the consumer, it has been late in accounting for the economic slowdown. 4.2% growth isn’t close to a recession, but the trend is problematic. Services outperformed manufacturing. This occurred as the ISM non-manufacturing PMI was 59.7 which beat estimates for 57.2 and prior report of 56.7. It beat the high end of the estimate range which was 58. This is one of the few spectacular economic reports which suggest the economic slowdown is over. It’s great if services outperform manufacturing. Services is a much bigger portion of the economy. As you can see from the chart below, the non-manufacturing PMI was 5.5 points higher than the manufacturing PMI. That's one of the largest differences in the past 18 years. I think manufacturing has a better chance of improving than services has of falling. Especially since the trade war has cooled off. This was the strongest PMI reading since November, but that doesn’t tell the whole story. As you can see from the chart below, the new orders index increased 7.5 points to the strongest reading since 2005. The business activity index was up 5 points to 64.7. Just like the manufacturing report, the prices index fell; this time it fell 5 points to 54.4. 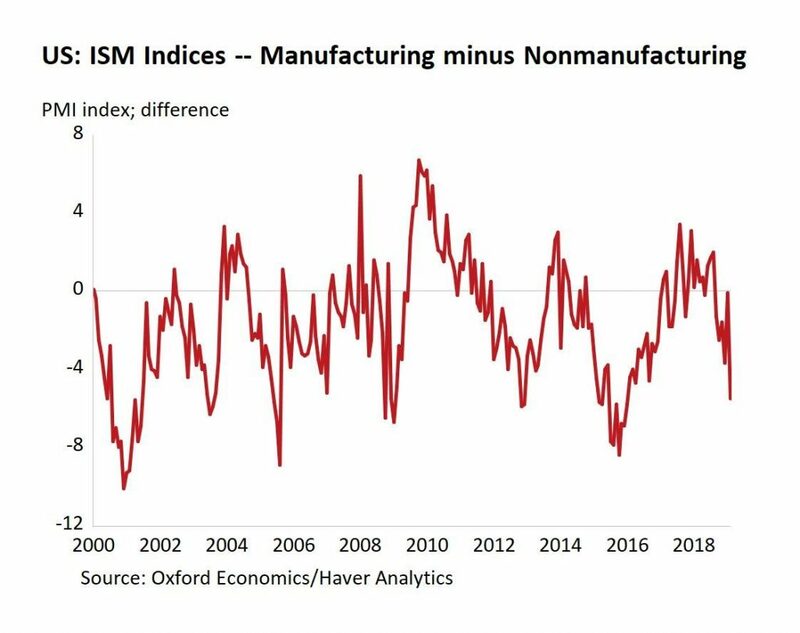 Unlike the manufacturing report, it’s still above 50. However, it fell at a quicker pace. This is the ideal situation as inflation is low and new orders are high.